Are you driving the ball 300-plus yards, yet still turning in a scorecard in the 90’s, even over 100? Sure, you can make each hole shorter with your drives off the tee-box, but if you’re struggling with your short game, your score card is going to reflect that. Mastering the skill of putting is an art, and we’re here to help you cut strokes when you land on the green. One of the easiest ways to turn a three-putt into a one-putt is the capability of reading a green. If you’re able to successfully read the break and determine the right speed, you’re bound to see the results in your next round. Keep in mind: read the greens quickly so you won’t slow up play for the group playing golf in Bucks County behind you. You have probably asked yourself, “How do I read a green?” You may have the problem of going straight to your ball on the green, squatting behind it to see the break, and doing your best estimation of where to aim the ball to find the bottom of the cup. The problem with this approach is the fact that everything looks flat, and you get confused about the slope and the way a ball will break. In best practice, read the green from your approach on the fairway. Stand back and analyze the entirety of the green. Does it slope right to left? Is the front elevated higher than the back? No matter where you’re ball is situated, understanding the big picture will give you a glimpse of your direction before you approach your lie. When approaching your ball, look at various angles on the green. Go to the highest point and look at the slope, analyze the fall line (where the slope begins), and view the angle directly opposite your ball on the other side of the flag. You should have a pretty good feel for the direction your ball will break after this analysis. With everything that goes through your mind on the green, a main question we ask is “What should my first read be?” Before you do anything else on the green, read the putt from behind the hole, looking directly at your ball. According to Phil Mickelson’s caddy Jim Mackay, in an article in Golf Digest, this read “provides the most accurate perspective of all because you get a closer look at the last few feet of the ball’s route to the hole. The area around the hole is critical: If there’s any slope at all, the ball will react to it because it’s rolling so slowly.” Right before you stand over the ball to putt, take a look from a side view angle. It is recommended that you stand on the low side of the hill—under your ball—to analyze the break. Take other factors into consideration, including your location and the way the grass grows on the green. Which way is the green sloped in position to the pin? 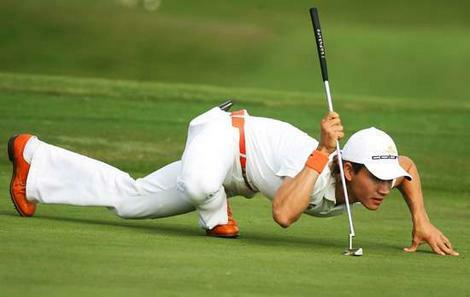 The more you play, the better you will become in the future at the art of reading greens. Anyone can determine the severe breaks, but it’s the subtle slopes that give us problems. Your eyes could see a break but the ball rolls straight, or vice versa. Tip to remember: the further you are away from the fall line, the more it is going to break. You’ll even see that putts inside of 5 feet have a break that you weren’t expecting. Learning how to read a green comes with practice, and your successes start with accurately reading the angle or slope of the putt. The speed is something that can be picked up after one or two holes, but reading the green is an art that must be mastered if you want to increase your handicap and take your game to the next level. When you need practice or a lesson, contact Northampton Valley Country Club. We’re one of the best-maintained golf courses in Pennsylvania. Take advantage of our practice range and putting greens to improve your score.